G. van der Lee Rope Factory can look back over a long and stirring history that dates back to 1545. 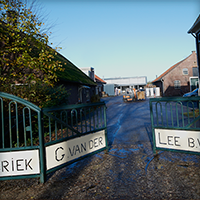 Van der Lee has been a division of Hendrik Veder Group since 2013. We are geared towards responding to individual customer requirements in various markets. Our assortment contains an array of high-quality natural and synthetic rope products and, if required we can make products per customers' specifications. A broad and varied product assortment is available for each of these markets.